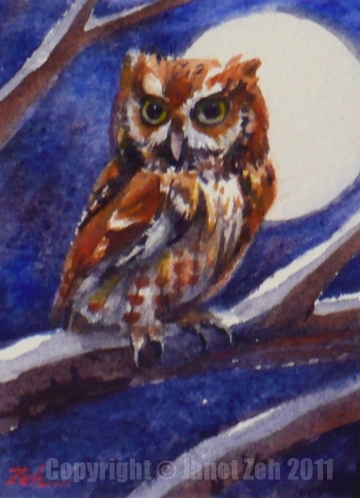 A little screech owl sits on a snowy tree limb silhouetted by the full moon. 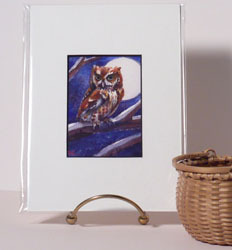 Several people have told me owls are a favorite bird of theirs. I imagine for every one who says so, there are a number of others who also like them - they're just not sayin'! The screech owl of North America has two color phases: red-brown and gray. I painted this one in the reddish phase (since I like color). It's rather spooky to hear screech owls at night because they give out a mournful wail. Have you heard them? See this or others of my bird paintings in my Etsy shop: Zehland.Etsy.com. Thanks for stopping by today! Thanks for the comment, Kessie. I agree that owls are gorgeous things. I like how the night scenes turned out. It's nice to do something different every so often.